Melodic comeback set from some of North Carolina's most adventurous. Bombadil, a North Carolina-based four-piece has certainly seen its share of trial and tribulation over the past few years. Scholarly and erudite, these aren’t your stereotypical rockers. The original drummer left the rigors of touring behind to pursue medical school. A new drummer jumped on board, but the group struggled with doubt, uncertainty, and most seriously, the rare nerve disorder that stripped multi-instrumentalist Daniel Michalak the use of his hands. Fortunately, Bombadil forged a mutual alliance with its fans, who had always passionately gotten behind each of the band’s releases and tours. 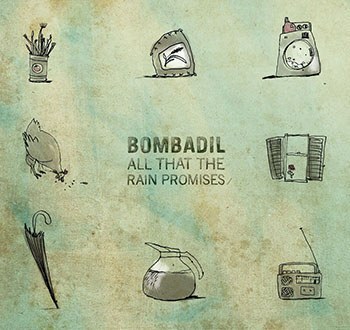 So, when things got tough, Bombadil leaned on that support and forged ahead to make All That The Rain Promises, a whimsically rollicking 11-track collection filled with spiritual declarations of hope (stunning opener, “I Will Wait”), go-get-‘em-next-time promises (the infectious “Laundromat”), and sardonic, hear-it-to-believe it nuggets (“A Question”). The musical palette is diversely arranged so that the album’s 33 minutes flow by in a flurry. You’ll hear country-folk picking, loopy instrumentation, and Band-like swirls of sound that lodge into your ear and make you hit play again after the last chords of closer “Unicycle” fade out. The future is wide open for the talented gentlemen of Bombadil. Here’s hoping they’ve got a few more tunes like these left to share.